Our thanks to Mr Claudio Salvucci for sharing this article with NLM. In this thinking, Vatican II represents a kind of cultural zero point. The Novus Ordo Missae is granted a lofty status as a de-Romanized, de-Europeanized, culturally “neutral” Catholicism—as the only truly primeval base from which true authentic inculturation can then properly begin. The sentiment is very typical of the last half century: that the classical Roman Missal has little or nothing to contribute to the liturgical and devotional life of modern Catholics. That attitude is not restricted to liturgical inculturation proponents, of course, but among them it seems particularly pronounced. Whether that thesis is historically defensible we’ll come to in a minute. 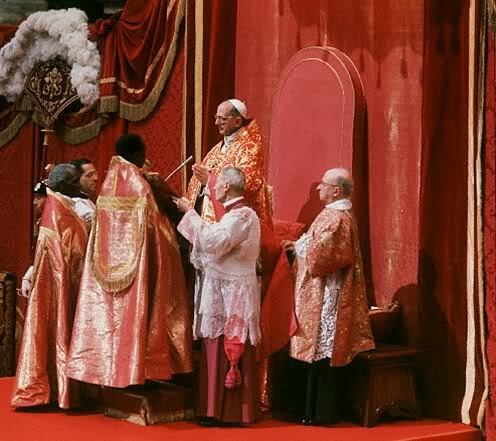 From the canonization ceremony of the Martyrs of Uganda in St Peter’s Basilica, October 18, 1964. But first, it’s important to point out that such a total repudiation of tradition is a Faustian bargain: its promise of a glorious liberated future subtly hides a ruthless eradication of the past. It tempts us with immense wealth we can bestow on our grandchildren, if only we agree to forge them from the melted-down remnants of our grandparents’ heirlooms. The etymological connection between “culture” and “cultivation” is not accidental—and every gardener knows that the difference between pruning limbs and sawing into the trunk is the difference between life and death. Whatever we want to argue about the Novus Ordo Missae, there is one thing we can never say about it: that it was the Mass of our ancestors. And that is universally true no matter who our ancestors were. St. Kateri and the Kahnawakeronnon who hunted in the forests of Quebec did not know it. The Servant of God Augustus Tolton and other former slaves who battled racial prejudice did not know it. The English recusants who sailed to Maryland on the Ark and the Dove did not know it. My great-grandparents who labored under the Italian sun did not know it. No one anywhere in the world knew it. This is not a mere rhetorical point; it is a glaring unacknowledged contradiction at the heart of our liturgical life. How can we assert the inviolate nature of non-Catholic customs and demand their preservation in the Church, while simultaneously discarding our native Catholic customs and culture in the process? A case has been made by Monsignor Pope for gospel music in predominately black churches, and no doubt many self-declared progressives would heartily agree with his arguments. But Monsignor also offers his parishioners the Traditional Latin Mass. After all, it would hardly make sense to promote the music of black Protestantism as the ne plus ultra of black religious culture while rejecting the liturgy and music that defined black Catholicism for centuries. Inculturation may make use of cultural norms that are Protestant in origin (Advent wreaths and the Ordinariates are good examples). But it must give priority to that culture’s Catholic heritage wherever it can, or it is intrinsically self-defeating. Putting those ideas into practice, Bishop Perry offered a Solemn High Pontifical Mass last year in honor of Father Tolton that featured motets by Afro-Brazilian composer José Maurício Nunes Garcia. It would be hard to argue that this Mass failed the standards of inculturation. The traditional Mass all by itself provided an essential liturgical connection to Father Tolton—it being the only Mass he ever knew or offered. And by linking Tolton to Nunes Garcia’s sacred music, the Mass was implicitly creating a distinct African tradition within the classical Roman liturgy. I’d like to pause on that verb “creating” for a bit. Can we not see from His Excellency’s good example that there is no loss of cultural creativity and progress in promoting the traditional Mass? There is no room to talk of fossilization, of stagnation, of repressively stifling traditionalism in an environment where black Catholics delve ever deeper into their own pre-Vatican II historical material, discover lost treasures mostly forgotten by other liturgists and scholars, and reintroduce them to new generations. I do not know whether “good Father Gus” ever had the time or resources to deliberately bring composers like Nunes Garcia into the schola of St. Monica’s. But with the resources we have, we can now do that. And so much more besides. No matter what our ethnicity, the Church’s long, long tradition is like a treasure trove in the attic, most of which has just been collecting dust and is ever in need of enterprising scholars to sift through, analyze, and bring into the present. Old St. Joseph’s church in Philadelphia had a community of black parishioners since the late 1700s—the French diplomat François Rene de Chateaubriand wrote a hymn specially for them that was then translated into English and was regularly sung into the turn of the century. A special Sunday Mass was offered for black Catholics, as well a Sunday Vespers service known as “Evening Hymn”. The band of celebrated black composer Francis Johnson (1792–1844) and the black vocalist Elizabeth Taylor Greenfield (1809?–1876) were featured, attracting crowds of all colors with music that was “sweet and silvery beyond description“. And that all from one single black Catholic community! 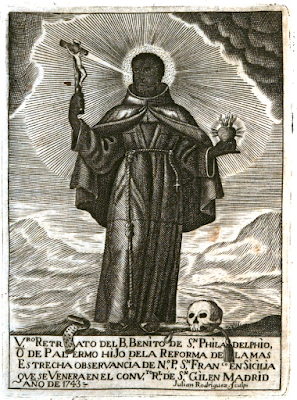 Most of the great orders and organizations that form the pillars of black Catholicism today—the Black Catholic Congresses, the Society of St. Joseph, the Oblate Sisters of Providence, the Knights of St. Peter Claver—arose in the pre-Vatican II period, and their archives no doubt contain many, many more fruitful avenues for research. Even secular scholars of the African diaspora are providing us with some fascinating information that can prove immensely valuable to the goal of inculturation. The Kongo Kingdom, once assumed to be only superficially converted by the Portuguese, is now increasingly seen as a self-defining Catholic nation where the faith had a profound impact on its folklore and culture. A fifth to a quarter of the Africans brought to America as slaves came from this region, of whom many were likely baptized Catholics. In much of the southern U.S. they were mostly subsumed into Protestant denominations, though some rebelled. When brought to Catholic nations, on the other hand, they quickly organized confraternities under saints such as St. Benedict the Moor. Processions in his honor were performed “with such devotion, majesty and pomp” that in 1619 they were attended by the King of Spain. In French Louisiana, the “Mardi Gras Indians,” often dismissed as a somewhat tawdry imitation of Indians or Wild West shows, have been connected by recent studies to Afro-Iberian Catholic ceremonies throughout the diaspora. Moreover, we have already seen how St. Benedict the Moor’s feast was kept with great festivity by members of the African diaspora. But this feast is not found in the general Roman or American calendars either pre- or post-Vatican II; it is a peculiarity of their own tradition, long shared only with local calendars in the Franciscan order and Sicily, and now spread to African nations like Ghana, Kenya, and Nigeria. There is certainly ample opportunity for more additions along these same lines, as the Roman Martyrology lists dozens of African saints that are not found in the general calendar. If we wish to make use of all this history, the way forward should now be clear. Creative inculturation ought to come not at the expense of tradition, but through tradition. It must continue to build on any new information that comes to light and revive old practices that have been allowed to lapse, while respecting the integral character of the rituals already used, expected, and cherished by the people over generations. Cutting ourselves off from traditional Catholicism does not keep us from being contaminated by excessive European influence. It just keeps us from discovering the fascinating ways over the centuries that non-European communities and cultures interacted with the faith, enriched it, and made it their own. Claudio Salvucci is the founder of Ancilla Press and the author of The American Martyrology (Arx Publishing, 2015). His current projects include a traditional Roman Missal for Afro-American communities.